Okay, Albert. You’re taking “The Decision” parallel much too far. Twitter is now buzzing with rumors of a new “dream team” considering making South Beach home — a team that includes Jose Reyes, Yoennis Cespedes, and, yes, Albert Pujols. Both Reyes and Pujols were in Miami last week to get an up close and personal look at the new stadium, the new unis and the new vision. And while initial reports claimed that only preliminary offers were made, sources now say two offers have been made. Reyes was offered six years at $90 million. But that’s insignificant compared to the nine-year, $225 million contract on the table for Pujols. The question then becomes, what now? We all know the scenario. I won’t recap, because anyone with even a casual interest knows the story. And while Cardinal Nation was distracted by the Tony La Russa retirement news and thus, the manager search and announcement, we all knew it was only a matter of time before all Cardinal news centered around Pujols. Still, hearing about Pujols’ visit to Miami stung a little. Especially after hearing how the Marlins seemed to pull out all the stops. Maybe not. But at this point, who really knows? I’ve always wanted to believe that Albert had such a passion for St. Louis and Cardinals baseball that this wouldn’t have to be so tense. I held out hope that a deal would get done mid-season. When that didn’t happen, I crossed my fingers that he’d realize (especially after such an incredible World Series run!) he simply didn’t want to be anywhere else (a la Adam Wainwright). And now, with a rival offer on the table, the games truly begin. So, I ask, what value do you place on one player when that one player is a living legend? How hard-nosed must you be for the sake of the business? I admittedly go back and forth on this issue nearly every day. I hope Mozeliak steps it up and offers him enough to beat out the competition. Then, I can’t justify sacrificing money that might be necessary to build a team around the star. I see ways to remain competitive on the field without him and, in fact, think building next year’s team is almost harder if he stays. Wrapping up so much payroll in one guy limits the options on others who are set to walk. But, it’s painful to imagine letting El Hombre suit up in anything but the Birds on the Bat. We can argue all day long about why he should stay, if he will stay, who will make the best offer, if the Cardinals will up the ante, but that’s been done … about 18,ooo times. To John Mozeliak and company: Please, don’t lose sight of who you’re dealing with. Is he enough of an asset to sacrifice other opportunities for? Maybe. Would it mean a lot to Cardinal Nation to know the best baseball player of our generation will hang up his cleats as a St. Louis Cardinal? Of course. I know it’s a business. You’re a smart man. I’ve questioned you before and you proved me wrong, but whatever you do, don’t sell Albert short. He is worth a massive contract. However, in all the hullabaloo, keep him honest. If he plays the diva role, he’s not the player we want to think he is anyway. I trust you. Do right by him, and you’ll do right by us. To Albert Pujols: Close your eyes. Think about the sound at Busch just before — and just after — the final out of not one, but two World Series wins in your eleven years with the club. Remember those fans — the same fans that gave you a stunning standing ovation at what could have been your final first at bat in a game wearing the home whites. Remember the faces of the fans who rocked the No. 5 on a jersey as they walked through downtown St. Louis. Or those who supported your foundation. Or who praised your loyalty. I’m not asking you to short-change yourself. But, please, be fair. You might get more money elsewhere. But is it worth leaving Yadi and Carp? Is it worth walking away from the “best group of guys” your teammates have ever been around? What means more — the extra millions that set the bar league-wide, or playing for the best fans in baseball? To Dan Lozano: I know you’re just doing your job, but don’t be ridiculous. Don’t make this about setting the standard. Make it about Albert and what’s best for him. Play the field if you must, but when it comes down to decision time, try to see more than dollar signs. When you meet with Mo later this week, try to find some common ground. We’re counting on it. To the other guys in uniform: Whatever happens, you are more than this drama, more than one man’s legacy. You are World Champions, and you have our trust with or without No. 5. 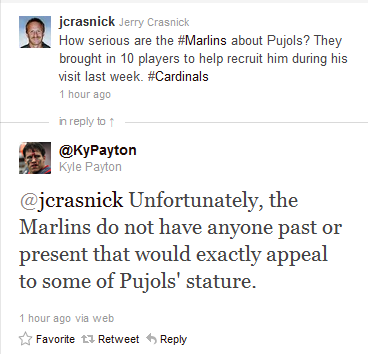 See, we in Cardinal Nation think you’re pretty great either way. Of course, we want Albert back as much as you do. But we’re Cardinals fans, not just Pujols fans. We’re along for the ride, wherever it goes. No matter what, GO CARDS!